As an independent and reliable provider of total cost management software for more than 20 years, Cleopatra Enterprise has been a stable factor in an otherwise turbulent market. Cleopatra Enterprise provides an integrated solution for total cost management, dedicated for large industrial projects. It is the only tool integrating true cost estimating, cost control and project analytics. As a result, both owners and EPC firms rely on Cleopatra Enterprise to manage their multi-billion capital projects as well as complex and time driven turnarounds. With Cleopatra you can successfully manage both your CAPEX and OPEX projects. For a project to be successful, the full scope has to be finished in time and within budget. Cleopatra Enterprise can be your key to a successful project. Regardless of the size or type of project, Cleopatra Enterprise makes sure you hold all the cards. Cleopatra Enterprise provides you with the cost estimation and cost control functionalities needed for the full project life cycle. From identification to abandonment, you can have a firm grip on the situation. The modular concept of Cleopatra Enterprise ensures you can tailor our software to become your perfect tool. Cleopatra Enterprise can help you to make better management decisions through custom reports. It can assist you in managing and controlling your contracts better. It allows you to have a detailed insight in your cost information for EPC and maintenance projects. Cleopatra Enterprise can be used to make all kinds of estimates, from factor to detail. Cleopatra Enterprise can also be your key to a successful tendering process as it allows you to estimate, request bids, analysis and keep track of cost quickly and accurately within one program. Cleopatra Enterprise is the professional cost estimating tool for today’s cost estimator. With the intuitive user interface, preparing a solid and trustworthy cost estimate has never been easier. Cleopatra offers all the latest techniques, such as location factor tables, smart cost models and flexible breakdown structures. Therefore, many companies worldwide have chosen for Cleopatra to improve their cost estimating process, from the very first conceptual estimate up to a definitive estimate based on detailed quantities. Cleopatra Enterprise offers you a unique combination of estimating and project controls in one tool. By linking your project controls document directly to your estimate, Cleopatra Enterprise will minimize data handling, increase efficiency and reduce the number of errors. 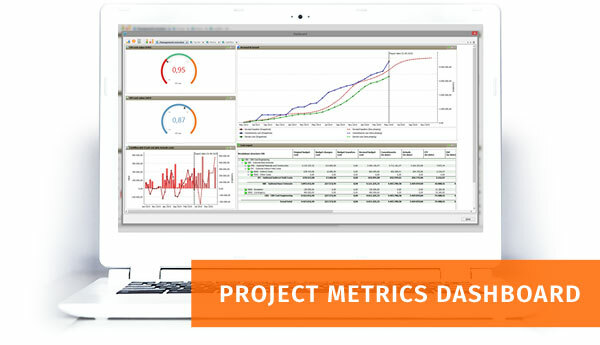 The combination of estimating and project controls in one tool provides you with a unique feedback loop, where your actuals give you the data for increased estimating performance. Furthermore, the connection of estimating and cost control provides you with great forecasting possibilities because forecasting is basically estimating. The Cost Management solution not only allows you to keep track of your costs, it also gives you instant insight into the hours, quantities, durations and even revenues. We provide an advanced suite of tools to perform Earned Value Management based on your budget and actuals, so you can easily keep track of the project performance. With the built-in progress measurement feature you can monitor productivity in order to perform more accurate forecasting. To see more of the software and its capabilities, request a demo. Executed projects provide a valuable source of information for cost engineers. With the Project Analytics capabilities in Cleopatra Enterprise you can easily perform portfolio analysis, compare cost estimates and extract important key metrics to benchmark against. Being able to benchmark your estimate against comparable projects and historical data will increase the confidence in your estimate significantly. Cost Engineering Consultancy provides cost engineering services for capital projects of all types to owners and contractors. Our experienced professionals understand the complex variables which determine cost -- materials, equipment, labor rates, productivity, profit, benefits, schedules, etc. We combine this understanding with unmatched estimating and cost management skills, accurate data and a thorough knowledge of your project objectives to create the information needed to make sound functional and economic decisions.